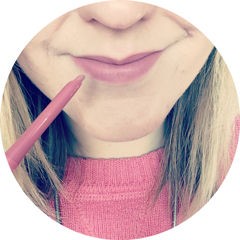 I'm not even sure the Pixi Glow Tonic needs any introduction as it is such a well known product and has a lot of hype surrounding it, especially in the blogger world. 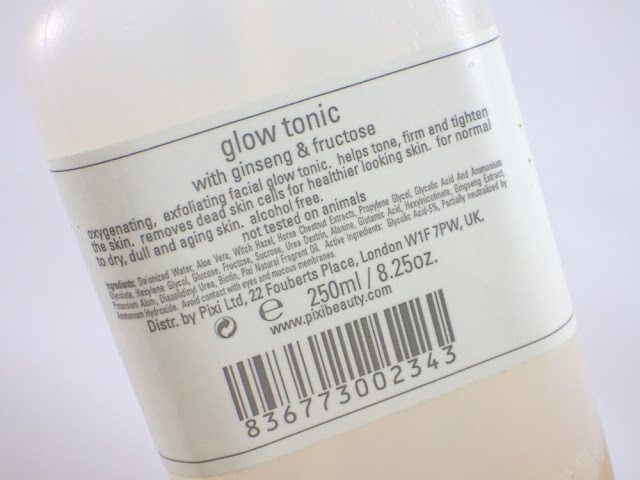 I know that I won't be alone in saying that I bought the Pixi Glow Tonic after reading about it on Caroline Hiron's blog. I loved the concept of it - it's basically an exfoliator in liquid form - so just knew I had to try it for myself. At the moment you can only buy it from Pixi's London store, however if you call them they will take a telephone order and post it to you with a delivery charge added on. Good news though - it will soon be available to buy online from Pixi's website! Pixi describe the Glow Tonic as follows; "Oxygenating, exfoliating facial glow tonic for normal to dry, dull and ageing skin. Helps tone, firm and tighten the skin. Removes dead skin cells for healthier looking skin." It is oil free, alcohol free and contains ingredients such as Ginseng, Fructose, Witch Hazel, Aloe Vera and Horse Chestnut Extracts, which work together to tone, firm, stimulate and provide oxygen to the skin. The other key ingredient is Glycolic Acid, which is an Alpha Hydroxy Acid (AHA). Acids that are classed as AHAs are able to exfoliate the skin by loosening dead skin cells, without needing any physical grains or beads that manual exfoliators have. AHAs are also meant to help reduce fine lines, wrinkles and dark spots. However they also make skin more sensitive to the sun, so sunscreen should be used when using any product containing AHAs. Pixi Glow Tonic comes in a 250ml clear and simple plastic bottle with a pump dispenser, so it's nice to know you're mostly paying for product rather than fancy packaging. I pump this two or three times onto a cotton wool pad after cleansing and then smooth the cotton wool pad all round my face. I then follow with a hydrating toner (currently the Liz Earle Instant Boost Skin Tonic). Just a note about the pump dispenser - the product spurts out pretty quickly, so if the cotton wool pad isn't directly in front of the opening you will find Glow Tonic on your bed/floor/clothes! When I first bought the Pixi Glow Tonic, I only used it about three times a week as part of my nighttime skincare routine. I found it replaced my manual exfoliator really well and got rid of any dryness easily and efficiently. However I wasn't particularly wowed and didn't really see any other benefits, although my skin did definitely have a nice glow after use. Things started to change more dramatically when I started upping how often I used Pixi Glow Tonic. I began using it once a day and then confident my skin wasn't reacting negatively, I increased this to twice a day, morning and night. I've been using it this way for nearly two months now and it's made a big difference to the blemish and spot prone aspect of my skin. The tonic makes my spots heal much faster and they disappear much, much quicker; it's a god send for scarring. I've also noticed that my skin is a lot calmer and although I am still getting breakouts on the t-zone, I haven't had any large, cystic-like spots since using this daily, just smaller blemishes and whiteheads. This in itself is amazing because cystic-like spots were becoming a daily nightmare for me a few months ago. I'm not sure if it's a specific ingredient in Pixi Glow Tonic that is contributing to this, or maybe it's just that the regular exfoliation means there's less chance for my pores to get blocked so badly. Just a note here that I haven't personally noticed any firming or tightening of my skin, which is also meant to be one of the benefits. If you have oily, spot prone skin like me, don't discount the Pixi Glow Tonic even though it says it's for normal to dry, dull and ageing skin. For me, it's star quality is the way it's reducing scarring and keeping those big, nasty spots at bay. Of course it's fab for exfoliating and giving your skin a glow too, but if you have normal or dry skin this may not wow you as much as you hoped, especially considering the hype surrounding it. I love it and I certainly won't be going back to a manual exfoliator anytime soon. Pixi Glow Tonic costs £16.00 and can be viewed on the Pixi website here. 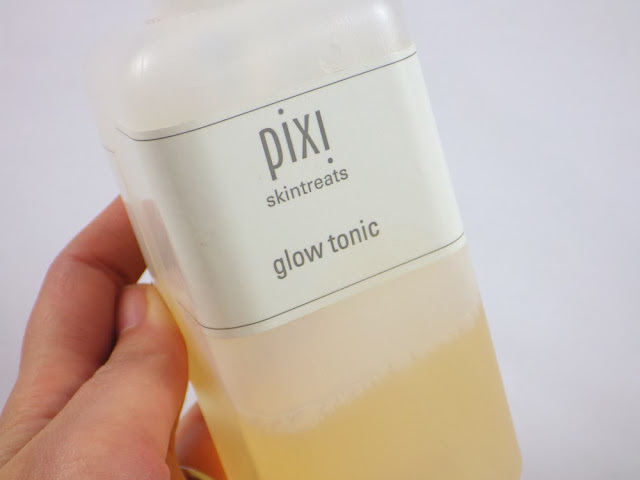 Have you tried the Pixi Glow Tonic? What do you think of exfoliating toners in general?